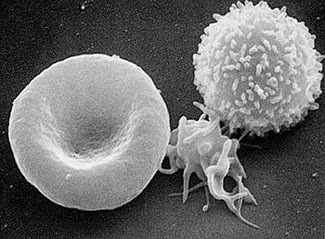 and a white blood cell. Hematopoietic stem cells (HSCs) differentiate to all other blood cell types, but there are still many questions about their development and how their fate is decided. Now, in a new paper published online this week in Nature, researchers from the University of California, San Diego School of Medicine elaborate upon a crucial signaling pathway and the role of key proteins, which may help clear the way to generate HSCs from human pluripotent precursors, similar to advances with other kinds of tissue stem cells. Principal investigator David Traver, PhD, professor in the Department of Cellular and Molecular Medicine, and colleagues focused on the Notch signaling pathway, a system found in all animals and known to be critical to the generation of HSCs in vertebrates. "Notch signaling between emitting and receiving cells is key to establishing HSC fate during development. What has not been known is where, when and how Notch signal transduction is mediated." said Traver. Traver and colleagues discovered that the Notch signal is transduced into HSC precursor cells from signal emitting cells in the somite -- embryologic tissues that eventually contribute to development of major body structures, such as skeleton, muscle and connective tissues -- much earlier in the process than previously anticipated. More specifically, they found that JAM proteins, best known for helping maintain tight junctions between endothelial cells to prevent vascular leakage, were key mediators of Notch signaling. When the researchers caused loss of function in JAM proteins in a zebrafish model, Notch signaling and HSCs were also lost. When they enforced Notch signaling through other means, HSC development was rescued. "To date, it has not been possible to generate HSCs de novo from human pluripotent precursors, like induced pluripotent stem cells. This has been due in part to a lack of understanding of the complete set of factors that the embryo uses to make HSCs in vivo. It has also likely been due to not knowing in what order each required factor is needed. Our studies demonstrate that Notch signaling is required much earlier than previously thought. In fact, it may be one of the earliest determinants of HSC fate. This finding strongly suggests that in vitro approaches to instruct HSC fate from induced pluripotent stem cells must focus on the Notch pathway at early time-points in the process. Our findings have also shown that JAM proteins serve as a sort of co-receptor for Notch signaling in that they are required to maintain close contact between signal-emitting and signal-receiving cells to permit strong activation of Notch in the precursors of HSCs." said Traver. The findings may have far-reaching implications for eventual development of hematopoietic stem cell-based therapies for diseases like leukemia and congenital blood disorders. Currently, it is not possible to create HSCs from differentiation of embryonic stem cells or induced pluripotent stem cells -- pluripotent cells artificially derived from non-pluripotent cells, such as skin cells -- that are being used in other therapeutic research efforts.